Please click on the image of the luggage rack for more information. Temporary luggage racks are available in the Classic style, the Sports style, the Sports Hex style, the Classic Hex style and in the European style. The Temporary luggage racks are suitable for installations where it is not possible or desirable to drill the trunk deck. ​In addition, the Classic Temporary luggage rack is available with a reduced footprint for use on cars with trunk mount spoilers. 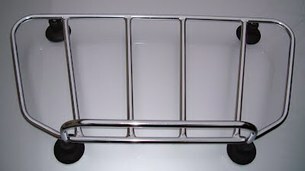 Temporary (removable) luggage racks are designed to be fixed to the trunk lid using rubberised clamps that are attached to either side of the rack. The clamps are tightened, using threaded studs and locking nuts, forcing the suction pads to clamp down onto the trunk deck. No drilling is required when installing these products. The fitting clamps are made from mirror polished stainless (inox) steel, and include rubber inserts to protect the paintwork. They are unique to each car so when ordering we need to know the make, model and year of your car. 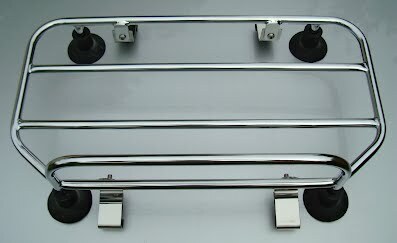 The luggage racks come complete with polished stainless steel hardware, and full fitting instructions.